No Nonsesne provided me with items in this post in exchange for a review. All opinions are my own. This post contains affiliate links. See my disclosure statement. My LuLaRoe Amelia dresses are my favorites. The fit of them just works for me and I always feel great in them. Often times, though, I wear them to work all dressed up and I neglect them for more casual wear. Today I want to show you a dressed up and dressed down look with this dress (how many times can I say dress?!). 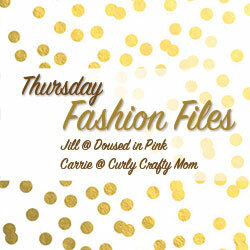 I'm thrilled to be co-hosting the Thursday Fashion Files link up today with Carrie and Jill! I'm also highlighting a few items from No Nonsense today. If you missed my last post working with them, you can check it out here. I love to mix prints. Love it! The No Nonsense tights I'm wearing have a subtle damask. Add in my floral shoes and I'm mixing three patterns here. It's a little bit much, but I think the subtlety of the print in the tights makes it work. On chilly spring mornings when I'm not quite feeling the bare leg, thin patterned tights are a great option. These floral flats are one of my favorite pairs of shoes. I highlighted all of my pointy flats earlier this week. 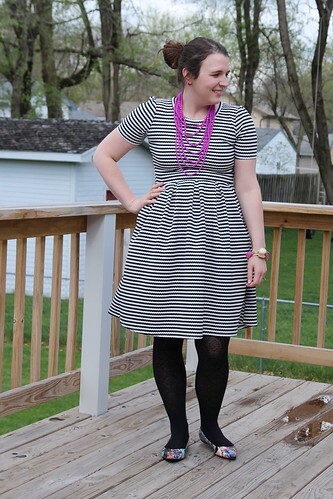 I added in my favorite pink necklace and some pretty bangles to complete the look. This look is exactly what I wore to work last week. I did trade out the flats for rain boots part of the day because I had to tromp around the city for a field trip. The polka dot boots added a whole 'nother later of fun! This is a look I could totally see myself wearing running around this spring or summer on a weekend. I almost added a jean jacket, but I thought the lace on the vest added another layer of fun and it isn't as hot as wearing a full jacket. I have a couple LuLaRoe Amelia dresses, and I could totally see this vest over a lot of them. I redid this vest from a jean jacket a few years ago and shared the tutorial. I'm also wearing some no show socks from No Nonsense under my Converse. They're great fitting and thin which will be nice for the hot summer. I am also wearing No Nonsense's awesome slip shorts! I received these the last time I worked with them and have LOVED them ever since. They do their job as a slip but also add a little control to the tummy area. What do you think? Which look is your favorite? 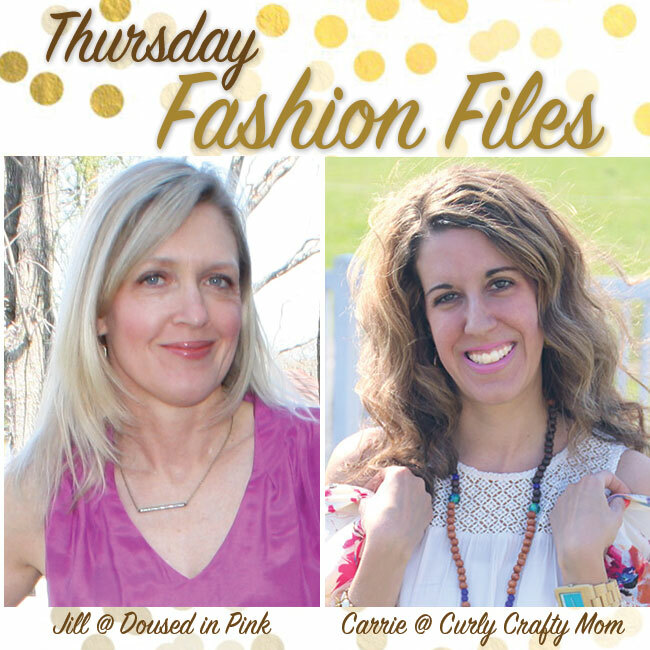 Linking up with Thursday Moda and Party at My Place. 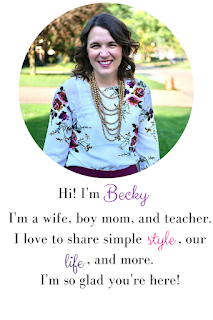 Becky from byBMG is our co-host this week. 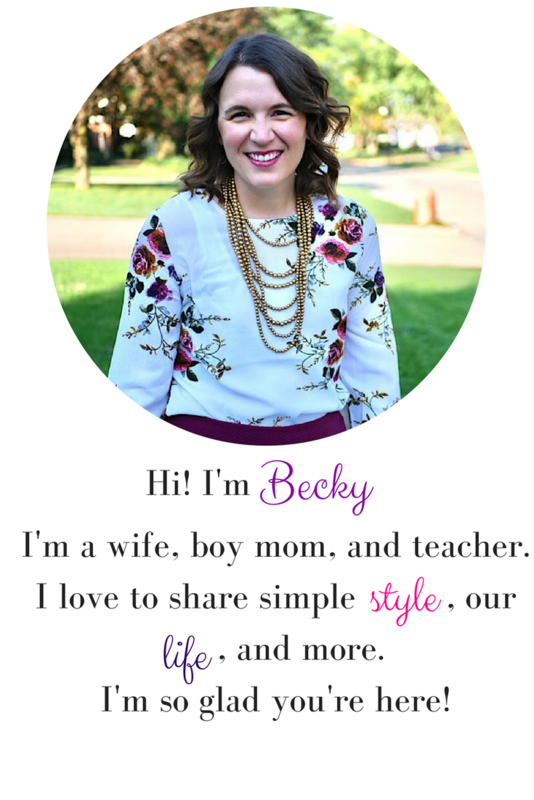 Becky is a wife and mom to three boys! She is great at styling colors, patterns and has the best selection of shoes! Be sure to stop by and visit her if you haven't already!